The Miami University Bookstore, with the cooperation of the bursar and payroll offices, has instituted a convenient computer financing program for current faculty and staff members who have at least two years of continuous employment. This program allows for monthly payments to be made toward a new laptop, desktop or iPad via payroll deduction — interest free. 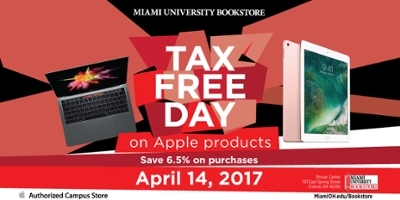 April 14, 2017, is Tax-free Day on Apple products exclusively at the bookstore. By combining these two programs, you'll save 6.5 percent and use interest-free, monthly, payroll deduction payments toward your Apple computer purchase total. This offer is not valid on Dell devices. Applications need to be completed and emailed to Bill Kraft, technology service specialist, at kraftgw2@MiamiOH.edu or dropped off at the bookstore by end of business on April 10, 2017, to qualify for the additional tax-free savings. Any applications processed after this date will include full tax charges. More information on interest-free loans for faculty and staff is online.